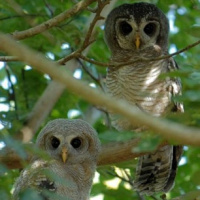 The African Wood Owl is a medium-sized owl with a rounded head and no ear-tufts. Typical male - Western Democratic Republic of the Congo © Bruce Marcot. Typical female - Northwestern Zimbabwe © Bruce Marcot. Description: There is some individual variation in general colouration. The facial disc is pale buffish-brown with darker concentric lines, shading into a dusky ring around the dark brown eyes. The eyelids and edges around the eyes are fleshy pink. The bill and cere are yellowish. The rest of the head and neck are dark brown, spotted white. The mantle, back and uppertail-coverts are dusky rufous, with individual feathers having narrow white bars near the end, white shaft-steaks and buff vermiculations. Scapulars have white outer webs, forming a white row across the shoulder. The flight and tail feathers are barred light and dark. The underparts are russet, densely barred whitish and brown. Tarsi are feathered pale buff with pale brown bars. The toes are bare, and coloured yellow-horn. Claws are greyish-brown. Size: Length 30-35cm. Wing length 222-273mm. Tail length 123-176mm. Weight 240-350g. Females are larger and heavier than males. 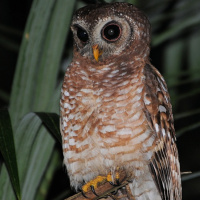 Habits: The African Wood Owl is a strictly nocturnal bird. It roosts during the daytime, singly or in pairs, in dense cover - mostly high in trees. 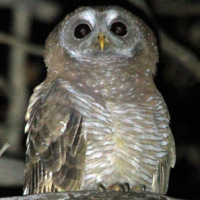 Vocalisations begin at night, often singing from exposed perches such as the top of a tree. Adults have been known to feign injury as a distraction if a nest with young is threatened. Voice: The song of the male is a loud, rhythmic sequence of clear hoots - "whubu-wububu-wubu". This phrase is repeated at intervals of several seconds. The female has a similar higher pitched call with the first double not more drawn-out and followed by a slightly longer pause - "whuhooh wububu-wubu". The female also utters a high "wheeow", often answered by the male with one or more low hoots. 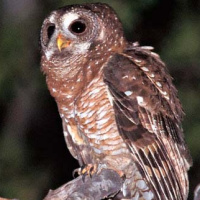 Hunting & Food: This owl feeds mostly on insects such as grasshoppers, crickets, cicadas, moths, caterpillars, and beetles, but will also take frogs, reptiles, small birds, small rodents and shrews. Most prey is caught from a perch, the owl normally watching its victim intently before swooping down on it. Also hawks flying insects in the air, and snatches small animals from vegetation while in flight. Breeding: Each pair occupies a territory throughout the year, and is particularly vocal before the start of the breeding season. Normally nests in a natural hole in a tree, often where a large branch has broken off. 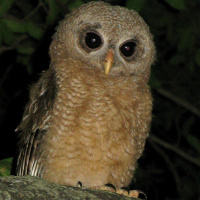 Occasionally uses a stick nest of a larger bird, or nests on the ground at the base of a trunk or beneath a fallen log. The female lays 1-3 (usually 2) rounded white eggs (about 43 x 37.7mm) at intervals of 2-4 days. She incubates the eggs alone, starting with the first egg, while the male supplies the food. The incubation period is 31 days, and the young hatch at similar intervals to which the eggs were laid. Chicks open their eyes 10 days after hatching. The female broods them until they are about three weeks old, then leaves them unattended at night to help her mate bring food to the nest. At 23-27 days old, the young leave the nest, but are still unable to fly, and remain in cover nearby where they are fed by both parents. By 46 days they fly well, staying with their parents for a further four months before becoming independent. Habitat: Forest, from the edge of primary forest to dense woodland. Also riverine forest and plantations. Ranges from sea-level up to 3700m elevation. 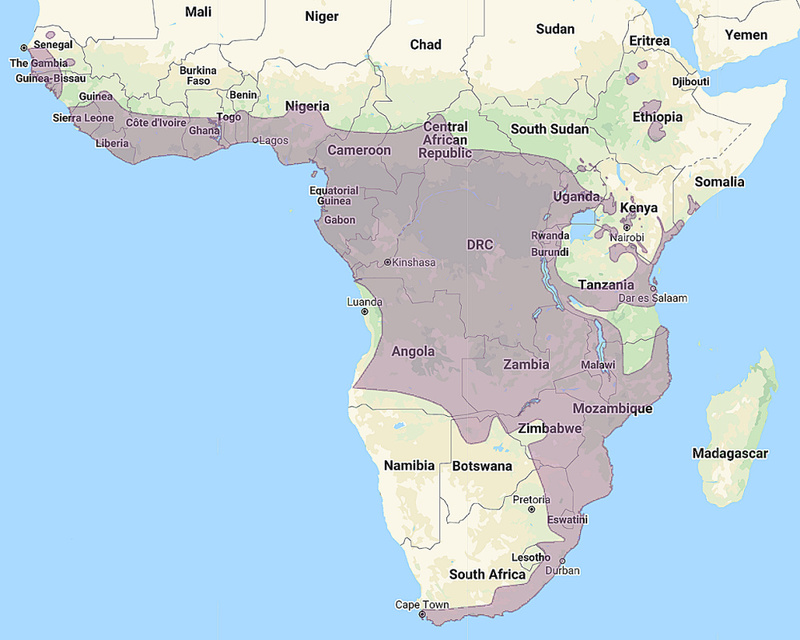 Distribution: South of the Sahel Zone in western Africa from Casamance, in Senegal, east to Ethiopia and south to the Cape in South Africa. Status: Generally common in suitable habitats. Original Description: Smith, Sir Andrew. 1834. South African Quarterly Journal (S. Afr. Q. J.; edited at the South African Institute) (2): p. 312. 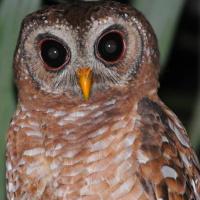 See also: Other owls from Africa, Genus: Strix. Page by Deane Lewis. Last updated 2015-10-31.